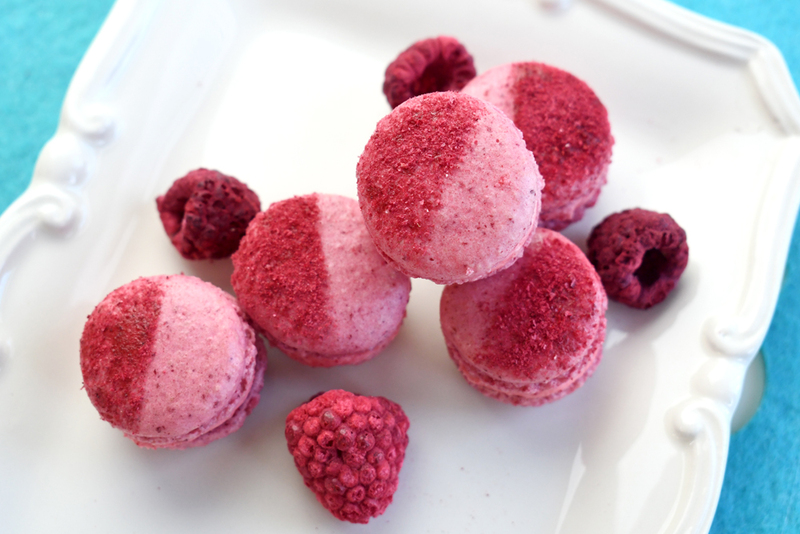 How to Make Freeze Dried Raspberry Macarons - Create. Play. Travel. Have you ever dreamed of making your own flavored macarons? These trendy cookies are a novel treat and often cost several dollars each at the mall. One winter day I decided to dig into the technical details required to make these colorful cookies. 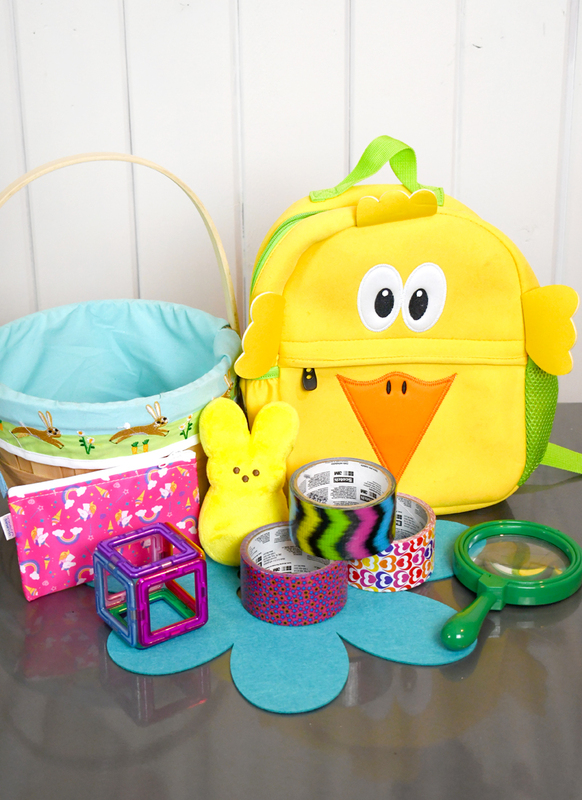 I started by doing my research and figuring out what can go wrong, which supplies I would need, and how to make the process as simple as possible. Once you learn how to make the basic macaron recipe, you can add all sorts of creative ingredients to make impressively creative treats! 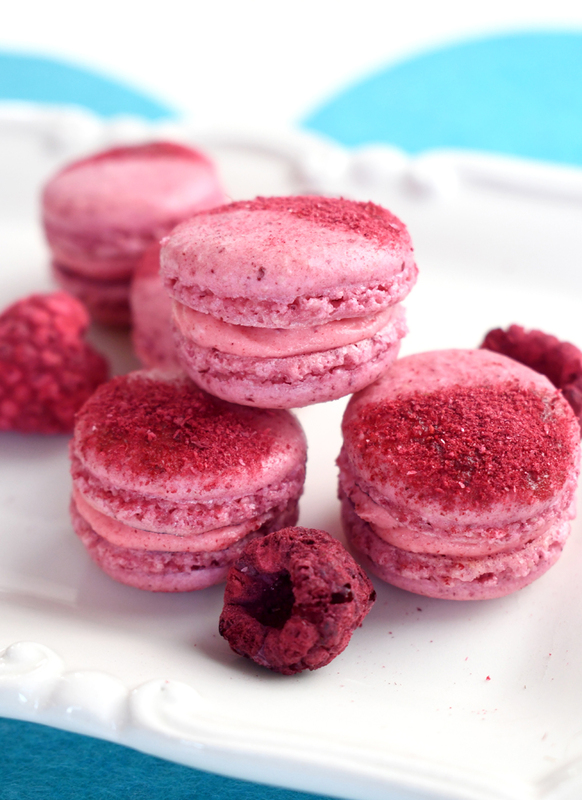 In this post I will share how to make homemade freeze dried raspberry macarons. I hope you have as much fun making them as I did! Macarons have become increasingly popular and are credited with being “the next cupcake”. However, if you’ve tried making them, you will have discovered that homemade macarons are harder to perfectly bake than you’d imagine. Before you attempt to make a batch of homemade macarons, you need some important kitchen supplies. 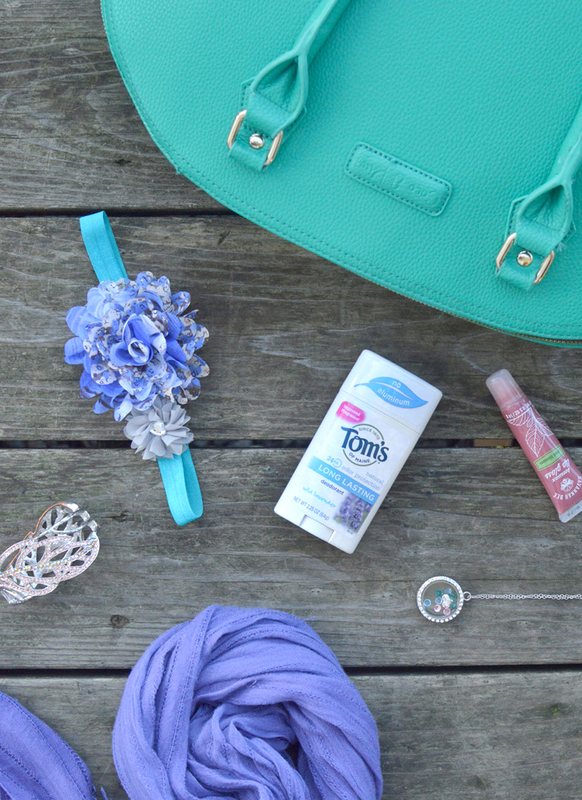 I’ll briefly explain why each item is needed! You will need an oven thermometer to make sure your oven bakes at an even, accurate temperature. Macaron recipes are temperamental to achieve the smooth tops and lacy feet that are characteristic to macarons. A food scale is the most effective way to measure exact ingredient amounts by grams and minimize extra moisture that can ruin your macaron recipe. A flour sifter is required because you will need to sift the almond flour and powered sugar together, twice. Any lumps or tiny grains in the macaron batter will interfere with the smooth tops of your homemade macarons. I found using a hand mixer to be the most effective for whipping the egg white meringue. Stable meringue provides the foundation of perfect macarons. It’s best to use glass mixing bowls to make homemade macarons, because you want to ensure the bowls are perfectly clean. Any oil that’s absorbed by the sides of plastic mixing bowls will destabilize the meringue when you are whipping the egg whites and cause your macaron recipe to fail. Baking sheets need to be lined with parchment paper or a silicone baking mat. You can draw circles on the backside of parchment paper or use the counting method described below to make identically sized macarons. 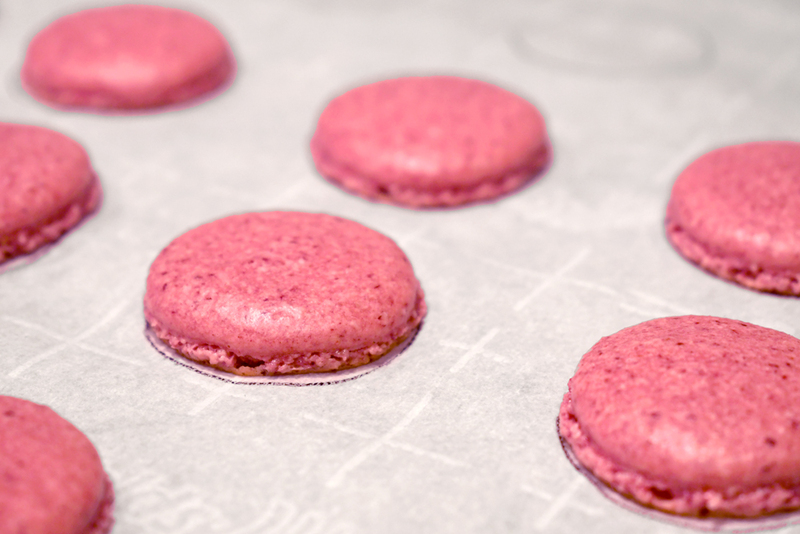 I found using a baking sheet lined with a silicone baking mat most effective for making perfectly round macarons. You will use the icing bag and large round piping tip to pipe the macaron shells onto the baking sheets, as well as fill the cooled macarons with buttercream frosting. 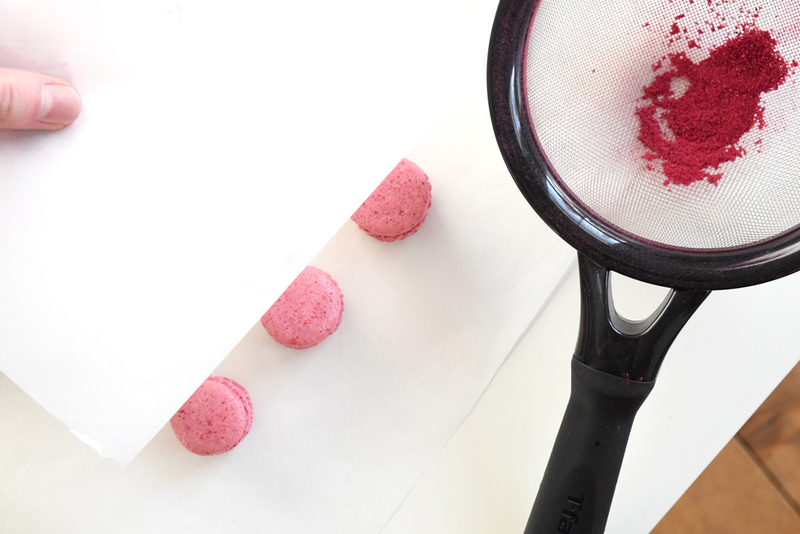 To make freeze dried raspberry macarons, start by crushing a handful of freeze dried raspberries between two pieces of parchment paper using a rolling pin. 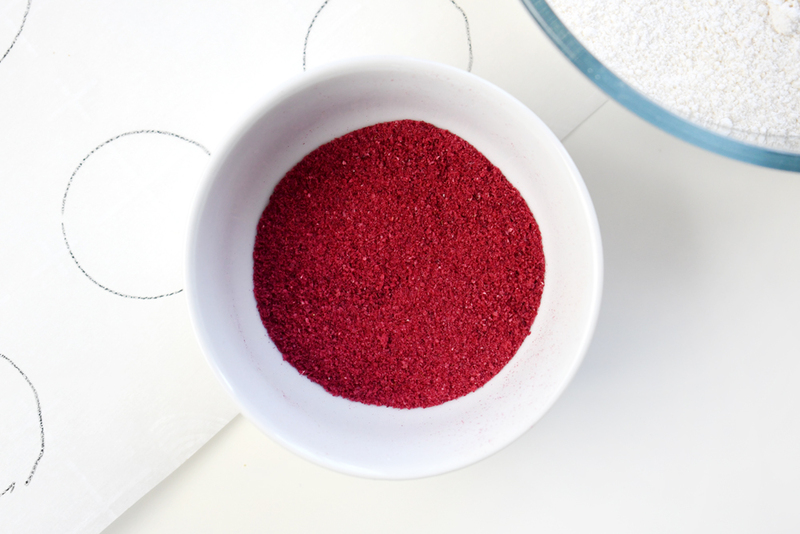 Sift the crushed freeze dried raspberries through a fine mesh strainer to remove the seeds and large particles. You should be left with a fine raspberry powder. 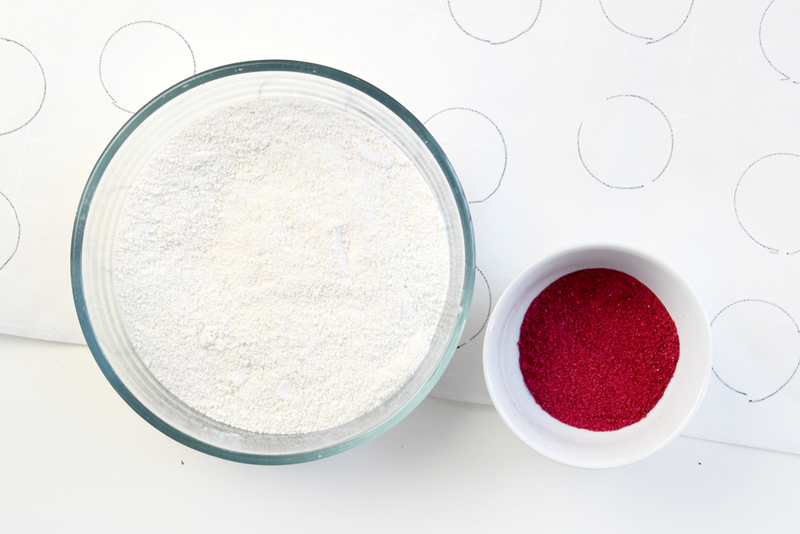 Next, sift the 100 grams* almond flour, 100 grams powdered sugar and 10 grams freeze dried raspberry powder twice using a flour sifter. 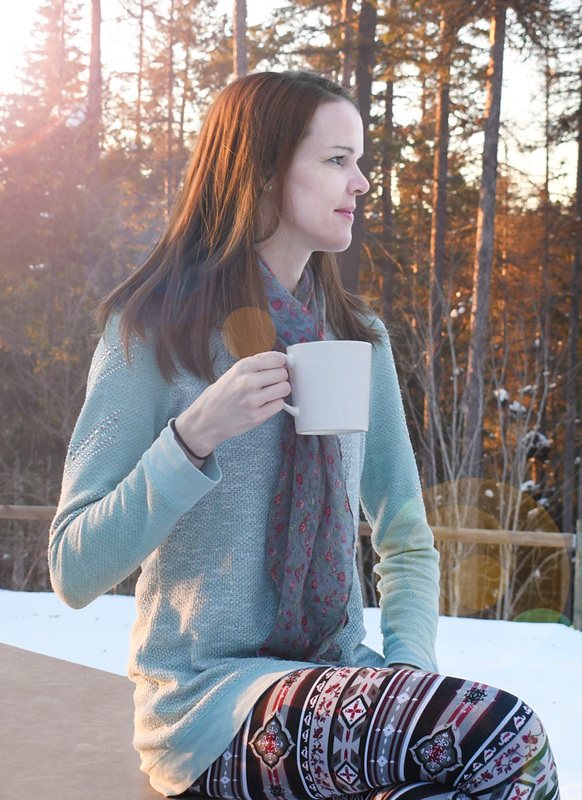 Each time you sift, you will end up with 1-2 tbsp. of large almond flour grains which you can discard. *I usually add 115 grams of almond flour, to make up for the discarded almond flour grains. The extra grams brings my total almond flour weight back up to 100 grams. Next it’s time to whip the egg whites! Select a perfectly clean glass bowl. Wash the bowl with dish soap and water if you are uncertain it’s clean and wipe it out with a paper towel. Any grease remaining in the bowl will mess up the stability of the egg white meringue. Measure out 70 grams of egg whites, which will be just under 3 egg whites. Don’t use the full 3 eggs worth because too much liquid will throw off your recipe. 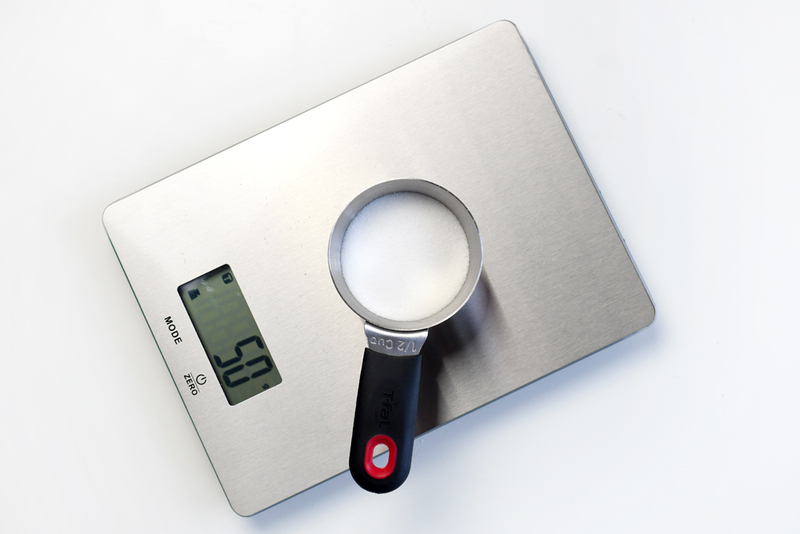 Measure out 50 grams of sugar. Use a hand mixer on medium to mix the egg whites into a froth. Add a pinch of cream of tarter and continue mixing. One teaspoon at a time, slowly add the 50 grams of sugar. 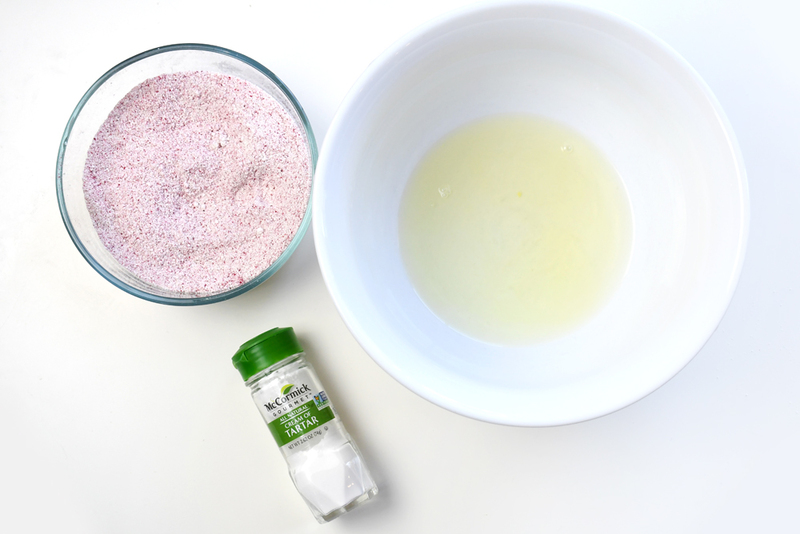 Hold the hand mixer with one hand and add the sugar with the other. Take your time; adding the sugar too quickly will cause the egg whites to fall. Once you’ve added the full 50 grams of sugar, turn the mixer up to medium-high. 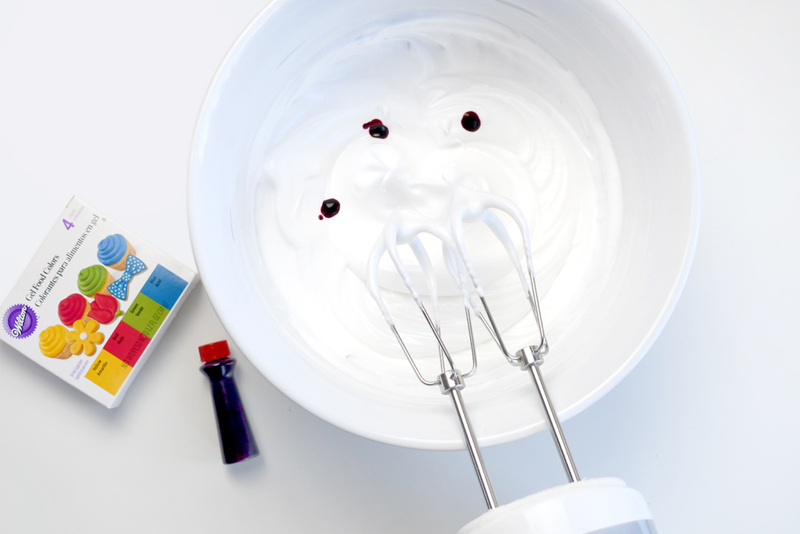 Mix until the egg whites reach stiff peaks, which will take approximately 10 minutes. When you’re getting close to creating stiff peaks, check often by turning off the mixer and lifting the beaters to see if stiff peaks form. 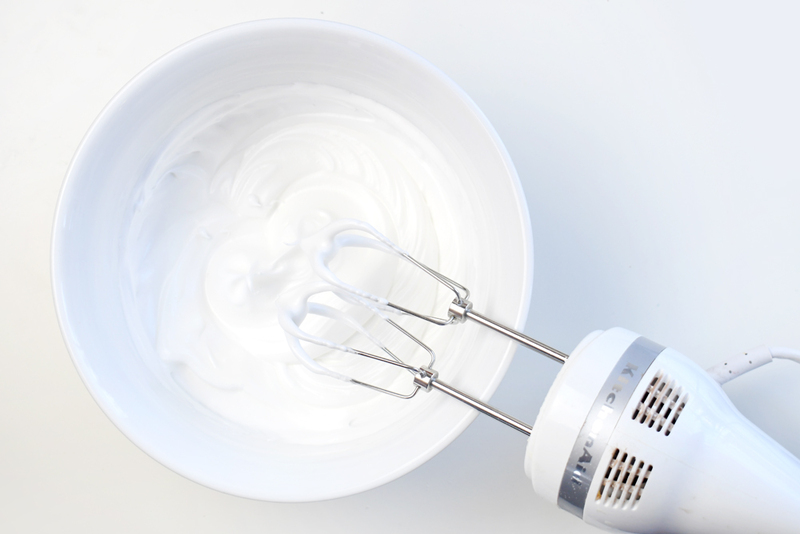 Once the egg whites are whipped into stiff peaks, turn down the mixer speed to medium for a few seconds and then off. 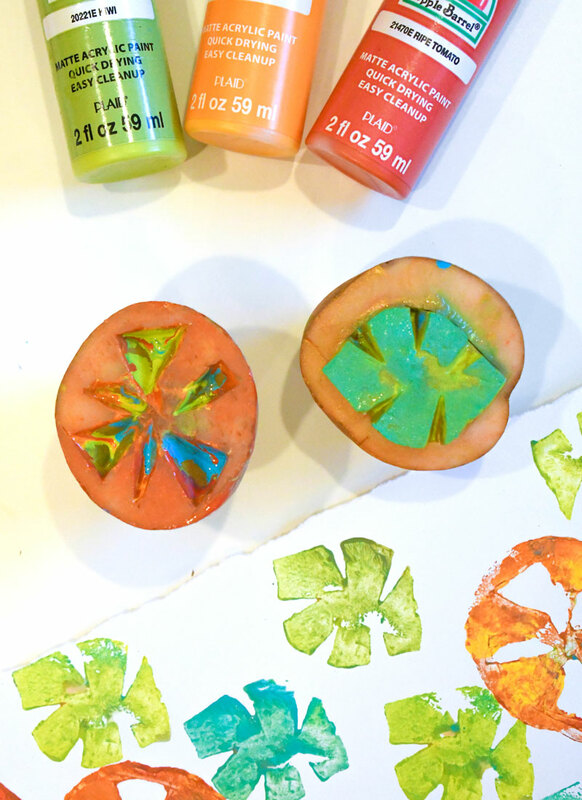 Add a few drops of gel food coloring* and a few drops of your preferred flavoring. 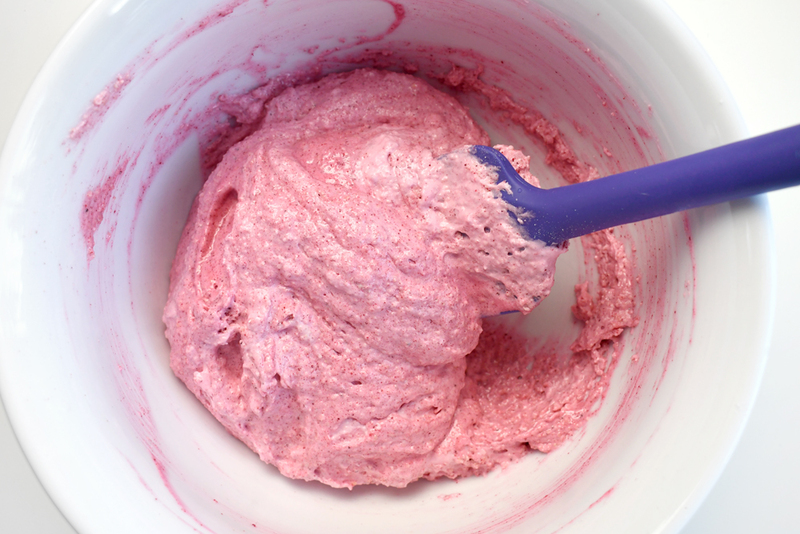 Turn the mixer on medium until the color is fully incorporated. *using regular food coloring will add extra unwanted liquid to your macaron batter, which may cause the macarons to not rise properly or crack on top. Macarons are made from two main components; egg white meringue and sifted almond flour/powdered sugar. Once the egg white meringue is whipped into still peaks and the almond flour/powdered sugar/raspberry powder is sifted twice, combine the two. Pour the bowl of dry ingredients into the meringue. Using gentle motion, combine the ingredients by scraping the bowl with a spatula and cutting through the middle, approximately 50 times. The batter will start out thick and will thin out the more you mix it. When you reach 50 strokes, check the batter by allowing it to drip into the bowl from the spatula. It should run like a ribbon with a lava-like consistency, and the edges should melt away within 10 seconds. If the edges don’t fully disappear, give the batter a few more sirs. When the freeze dried raspberry macaron batter is sufficiently mixed, scoop it into a piping bag that’s fitted with a large round tip. Line several baking sheets with parchment paper or silicon baking mats. Easily make a whole tray of identically sized macarons using several methods. You can draw circles on a piece of parchment paper, flip it over and use the circles as a guide when piping your macarons. You can also use the counting method when piping your homemade macarons (my preferred method). Simply apply even pressure to the piping bag and count to 3 when piping each macaron. 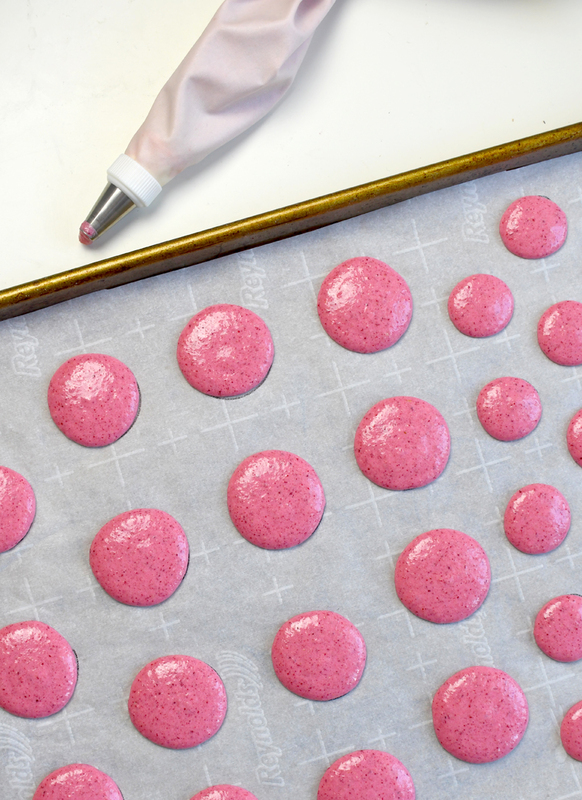 The counting method will allow you to pipe similar sized macarons in an efficient way. The macaron batter will spread out a bit; piping a quarter sized circle will create a half-dollar sized macaron. Once piped, hold the baking sheet level and tap it on the counter several times to release any air bubbles. You can make large and small macarons to create a variety of treats, but the sizes will need to be consistent so each half will match up with its other half. Allow the macarons to dry for 40 minutes (or 20 minutes in front of a fan) until they are no longer sticky to the touch. Not drying the macaron shells before baking will cause the tops to crack. Once the macaron batter is dry to the gentle touch, bake them in the oven at 300 degrees for 15 minutes. The macarons are done when they are no longer sticky on top. Remove the macarons from the oven and allow them to cool for a few minutes. Then gently peel each macaron off the parchment paper and transfer to a cooling rack. Finally, make the buttercream icing. Combine 1/4 cup softened butter, 1 cup powdered sugar, 1 tbsp. milk, pink gel food coloring and 1 tsp. 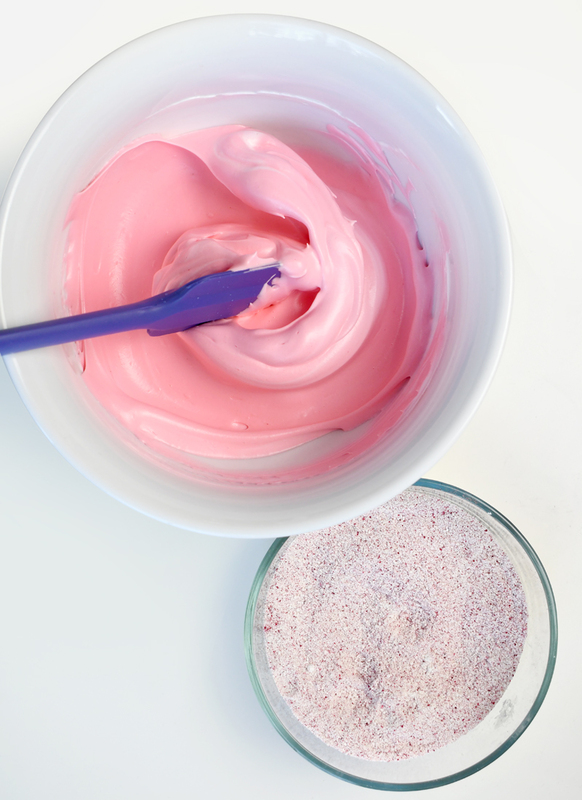 raspberry powder. Mix with the hand mixer on medium until smooth. Pipe a large dot of buttercream frosting onto a cooled macaron shell and gently press another shell on top. Repeat for the remaining macarons. 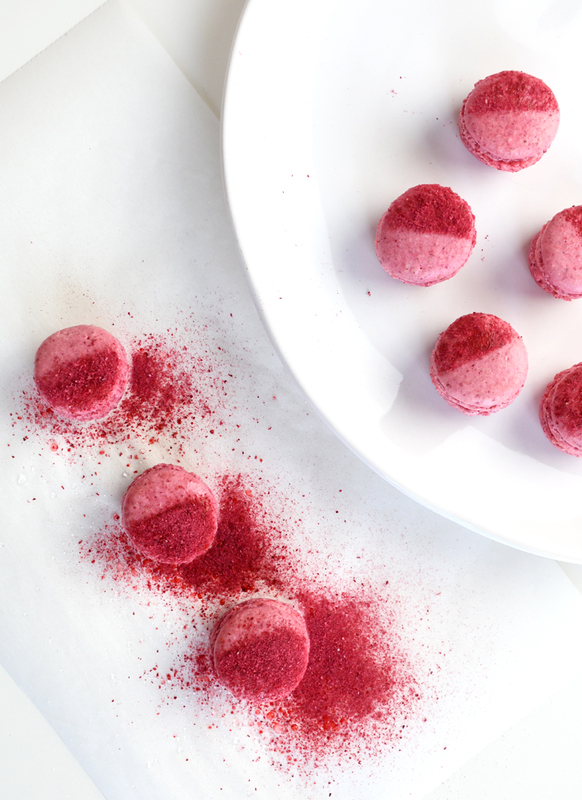 I dusted these freeze dried raspberry macarons with extra raspberry powder. I used the following method to complete this optional decorative step. Hold a piece of paper over half of each macaron. Moistened the shell with 1 spray of water from a spray bottle. Dust on some freeze dried raspberry powder through a fine mesh strainer. Homemade freeze dried raspberry macarons are really fun to make! They’re perfect treats for a tea party or a birthday celebration. If you can follow precise instructions and measure out ingredients carefully, you can easily make successful macarons! Each of these issues can each affect the outcome of homemade macarons. Ultimately, these cookies are special to master. Once you have learned the basic technique, you can accomplish many creative macaron combinations with colors and flavors!